Business IT Outsourcing, Custom Computers, Network Security and More. If you haven't discovered "The iNET Difference" yet, now is a great time! As computer price competition drives quality through the floor and getting tech support requires negotiating a phone maze just to get connected to an outsourced service technician in India, one computer repair and information technology company makes computer headaches a thing of the past: NET PC in Waukesha, WI. We offer the highest quality computers and servers, the fastest Milwaukee computer repair service, and the best computer warranties in southeastern Wisconsin (or anywhere else)—all at prices making iNET PC's Milwaukee computer store competitors grind their teeth in frustration. Most computer issues can be sorted out remotely. Virus removal, spyware removal, and slow performance issues can all usually be resolved without having to bring your computer in for repairs. We provide easy, hassle-free remote computer repair services to fix your computer without you even leaving your home or office. Our technicians will work remotely from our computer repair shop in Waukesha to solve your computer issues. Don’t let long boot-ups, viruses and slow computer performance or freezes ruin your day. Call iNET-PC at 262-574-9400 for fast, convenient Milwaukee computer repair service. Computers from big box stores or online retailers can seem like a good deal, until the second-rate computer parts break down and you spend hours on the phone waiting for tech support, or have to mail your computer to a repair center and wait weeks on end to get it back. INET PC custom computers don't have nearly the maintenance troubles of mass-produced computers, but if you do have an issue with an iNET computer, simply bring it in to our Waukesha computer store and we'll take care of it. No waiting on the phone, no mailing it in, and no hassles. Anything that goes wrong with your computer is covered under our 3-year warranty. Other Milwaukee computer companies would go broke trying to live up to iNET PC standards. At iNET PC, we build every computer as well as it can possibly be built, treat every customer as we want to be treated, and provide the services customers need, like comprehensive software set-up and free computer training in Waukesha. Sounds simple, right? It's not. If it were, we wouldn't be the only Milwaukee PC and information technology company doing it. At iNET PC, it doesn’t matter what you know or don’t know about computers. Our helpful sales staff and technicians are glad to educate you and patiently walk you through the best options for your computer needs. 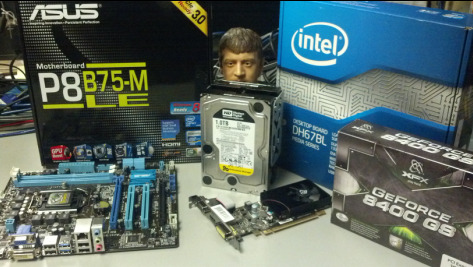 Our Waukesha computer store carries a huge inventory of computers and computer parts for custom builds. We guarantee our work with an unmatched three-year parts and labor warranty. iNET computers can be easily upgraded as technology evolves and your computer needs change. Long after lesser computers break down or become obsolete, an iNET PC computer will still be perfectly usable. Milwaukee IT support from iNET PC can save your business big money. Instead of hiring your own IT support staff, hire iNET. Your business can harness the experience iNET's computer repair technicians have gained through working with thousands of different customers and technologies, and we'll be available after hours or over the weekend if the need arises. INET has built business IT networks from the ground up dozens of times, offering the best software, servers, and security in the Milwaukee area. iNET PC also offers point-of-sale systems for Milwaukee area restaurants and retail stores, including customized POS software and equipment-- all seamlessly integrated into your business. We provide touchscreen POS hardware, custom programming with Aldelo POS software and wireless iPad POS solutions. Whether your business is in Waukesha, Milwaukee, Racine or anywhere else in southeastern Wisconsin, iNET's on-site IT support technicians will install your customized POS system and even train your staff how to use it. iNET offers live, local, 24/7 technical support for your POS systems, giving you the best overall value on POS systems in Milwaukee. Whatever your information technology needs, from off-site data backup to phone systems to Aldelo POS updates and security cameras, iNET PC will provide better service at a better price than any of our competitors. iNET PC carries the computer parts Milwaukee businesses and individuals need most, as well as high- performance upgrades and things if you asked for in those big box stores would just leave the clerk scratching his head. At iNET, we have virtually everything a computer user could need—including the expertise to get your computer, or even your entire network, running flawlessly. Whether you just need to pick up some USB drives or need motherboards, RAM, CPUs or PSUs, you probably want it ASAP. Which is why you should head straight to iNET. We have Milwaukee’s largest inventory of computer parts and expert technicians to help you choose the best parts for your needs. We’ll even install your parts and programs for a very reasonable fee. Call 262-574-9400 or stop in our Waukesha Computer Store Monday–Friday 8 am to 6 pm, Saturday 9 am to 2 pm (extended hours available upon request) for more information on our computers, IT support or Point of Sale Systems. Second-tier Milwaukee website developers are whining and complaining: "It just isn't fair, the best computer and IT company is also the best Milwaukee website design and development company." iNET creative genius inspired websites are appearing at the top of free Google searches and making businesses across the country more profitable than they ever dreamed. While most web developers don't even care if your website is bringing in new customers, iNET considers your profitability the only measure of our success. Contact us online for Milwaukee IT support services or to learn about our profit-generating web development services. Call 262-574-9400, or email sales@inet-pc.com and experience the iNET difference today.